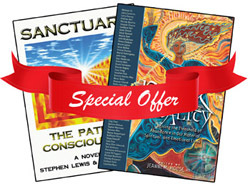 Sanctuary: The Path To Consciousness is published by Hay House, and is available for purchase directly from EMC² for $8.50 plus shipping and handling (rates listed below). To order Sanctuary in Paperback, click here to complete an order form. The entire book on a set of six CDs is available exclusively from EMC². The suggested retail price is $39.95, however you may purchase the CD set at a special price of $14.95 plus shipping and handling (rates listed below). To order Sanctuary on CD, click here to complete an order form. If shipping option is not specified, products will automatically be shipped 1st Class. 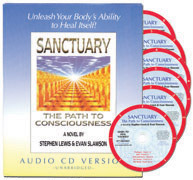 Purchase both Sanctuary: The Path to Consciousness and Peak Vitality directly from EMC² for $23.50 plus shipping and handling (rates listed below). Click here to complete an order form. products will automatically be shipped 1st Class.